Introducing Haydn - Symphony No. 94 "Surprise"
Anyone who has blasted Arcade Fire before a party can attest to music’s transformative powers. But music isn’t just a mood-booster: Music therapists use pitch, rhythm, melody and lyrics in specific ways, with the explicit intent of affecting cognition or emotion in the person who is hearing them. Music therapy became a clinical profession in the 1940s, after doctors and nurses noticed that war veterans suffering emotional and physical trauma responded well to musicians who gave volunteer performances in hospitals. Nevertheless, the profession spent decades on the fringes of medical science, until the early 1990s when advances in neuro-imaging technologies confirmed that musical activities had profound effects on the brain. Since then, researchers at the frontiers of music therapy have developed strong evidence that musical interventions can reduce chronic pain, help stroke patients regain speech, increase social engagement in children with autism and help patients with acquired brain injury or Parkinson’s disease improve their gait. “It’s really its own science,” said Dr. Larry Frisch, an associate professor of population and public health at the University of British Columbia, who helped bring together leading neuroscientists, psychologists and music therapists for a four-day conference on music therapy earlier in May at UBC. Presenters shared findings showing that music therapy can calm Alzheimer’s patients, help addicts commit to treatment, and ease suffering in people with clinical depression and anxiety. Here are just a few of the ways that music can heal. Music therapy improves behaviour in patients with moderate to severe Alzheimer’s disease, reducing agitation and irritability as well as eating difficulties and sleep problems, according to preliminary findings from a study conducted at UBC. Lead researcher Dr. Robin Hsiung, an associate professor of neurology at UBC, described the calming effects of music therapy as almost equivalent to that of a tranquilizer, “but with much less side effects,” he said. Hsiung said patients’ improvements lasted for several days – and up to a week – after a one-hour individual session with a music therapist. The therapist talked to patients about their musical tastes and past experiences with music, and engaged them in activities such as singing or listening to familiar music. He and his colleagues used standard measures of behaviour in Alzheimer’s patients to monitor any changes during the 12-week active study period compared with patients in a control group. They also measured patients’ levels of the hormone cortisol, a biological marker for stress. 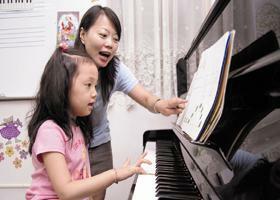 Again, patients who received music therapy “were less stressed by cortisol measure,” he said. He said the study, which has not yet been published, was more rigorous in design than earlier studies showing a benefit in Alzheimer’s patients who had music therapy. Hsiung and colleagues excluded patients with an extensive music background, who might respond more favourably to music. In addition, the study included a control group of patients who knew they would receive music therapy but remained on a wait list throughout the active study period. Without a comparison group, Hsiung explained, the researchers would have no way of knowing whether patients were getting better on their own. Hsiung said it remains unclear whether the behavioural improvements in Alzheimer’s patients were due to the music itself or to the caring provided by the music therapist. But “now that we have some numbers, we can design a different study to look at that specific aspect,” he said. Music therapy can increase motivation for treatment in patients with substance-abuse disorders, improve decision-making skills and help prevent relapse, said Beth Clark, a music therapist and registered clinical counsellor who has worked with addicts in the Vancouver area. She cited randomized controlled trials conducted by Dr. Michael Silverman, director of music therapy at the University of Minnesota. One of his studies, published in 2012, involved inpatients in a detox centre who were randomly selected to either attend a songwriting workshop or remain on a wait list for music therapy. Compared with the wait-listed group, patients who received music therapy through songwriting activities had significantly higher motivation and readiness for treatment, the study found. “It showed results after just one session,” Clark said. Many addicts suffer from cognitive impairments that interfere with their ability to abstain from drugs or alcohol, Clark added. Recent studies from the University of Miami suggest that music-based cognitive rehabilitation may help reduce impulsivity, which can lead to relapse. In this method, a patient may be asked to play simple notes on a keyboard in time to a metronome while the therapist plays other rhythms at random. Researchers theorize that, over time, the attention required by the task may strengthen executive functions involved in decision-making. Listening to music changes a person’s experience of time, space, body and relationship, said Dr. Jennifer Nicol, a music therapist and associate professor of educational psychology at the University of Saskatchewan. For patients with clinical depression and anxiety, the ability to “get lost in music” can bring a sense of emotional freedom. But music isn’t simply a distraction, Nicol said: “It’s a meaningful reprieve.” Patients in her studies have compared listening to music with being in the company of a long-time companion who helped them to cope. Increasingly, researchers are studying the psychological effects of music in randomized controlled trials. For example, a study published in 2012 in the Clinical Journal of Pain measured levels of depression and anxiety in chronic-pain sufferers. Patients in the musical intervention group listened to a standardized 20-minute session of instrumental music from a genre of their choice twice a day, for 60 days. At a 90-day followup, patients who received the musical intervention had a 50-per-cent reduction in anxiety and depression according to standard tests, compared with a 5- to 7-per-cent reduction in the control group. Other studies showing that specific types of music may enhance relaxation have given rise to the notion of a musical prescription for anxiety or depression. But according to Nicol, the most important thing for patients’ psychological well-being is “familiarity and choice and enjoyment of the music they’re listening to,” she said.